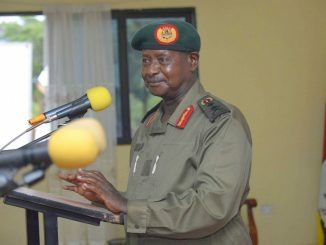 President Yoweri Museveni has advised farmers in Teso sub-region to concentrate on growing citrus fruits if they are to improve their household incomes and transform their livelihoods. The President said that the production of fruits in Teso sub-region alongside fish farming and poultry keeping, can transform the region if perfected by the communities. 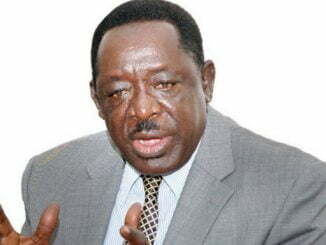 He was speaking during the much-anticipated commissioning of Soroti fruit factory on Saturday. 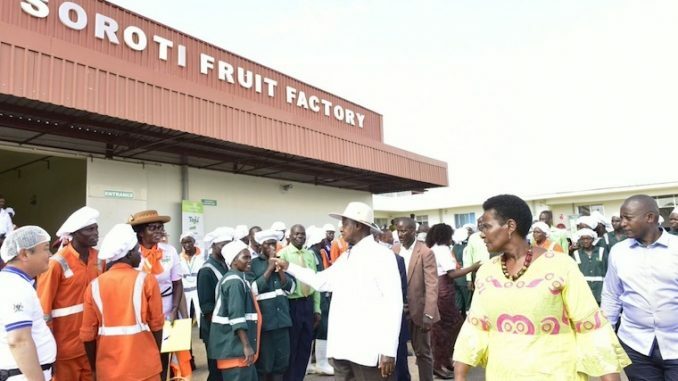 The Arapai based factory was established to mainly take advantage of the mangoes and orange fruits in Teso sub-region as a government-directed intervention aimed at supporting value addition in fruit processing in the Teso region. The plant has the capacity to crash six tonnes of concentrates from oranges per hour and two metric tonnes of mangoes per hour. Museveni castigated colonialists for zoning Teso region and parts of Lango for cotton growing. He said the move misled farmers into investing time and other resources on a nonprofitable venture for the region. “That is why I am recommending fruits, and I have gone further and studied the global market. The demand for fruits in the world is very big, there is no danger of having no market. The same for dairy products or milk, the same for fish. That is why I’m recommending these products, poultry I’m not so sure but you can study the issue of poultry. Therefore, let us go into fruits because they are the ones which are the medicine of poverty for the people in an area like Teso and some parts of Lango. 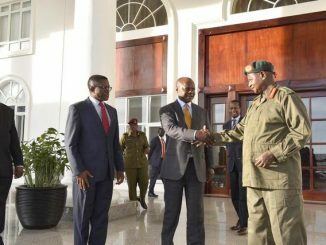 In other areas we recommend coffee,” said Museveni. Trade minister Amelia Kyambadde said farmers should supplement the oranges with pineapples and mangoes in line with the government’s new strategic development plan of shifting to agro-based industrialization. “We have a strategic plan that has been launched today and I thank the president for that. In this, we’re prioritizing investment in agro-based manufacturing and definitely recruitment of scientists and engineers but also shifting to other commodities like mangoes, pineapples and passion fruits. For pineapples, we shall be processing 4 metric tonnes per hour, passion 4 metric tonnes per hour and mangoes 2 metric tonnes per hour. So I would like to encourage all of you farmers to start thinking of growing other commodities because you will be able to benefit because this plant will be able to accommodate that,” Kyambadde said. The multi-billion project is implemented through a joint venture partnership between Uganda Development Corporation (UDC) and Teso Tropical Fruit Cooperative Union through a grant from the Korea International Cooperation Agency (KOICA). Under the arrangement for the establishment of the fruit factory, the government provided land, utilities, and infrastructure while KOICA pledged a grant of $7.4 million for a Turnkey factory involving the construction and machinery purchase, installation and commissioning. Ha Byung Kyoo, the Korean ambassador to Uganda advised that smallholder farmers in Teso should be given priority to supply fruits to the factory directly so that they realize tangible income. Earlier, farmers expressed worry that they had not been advised on the prices at which the factory will be buying their produce. Initially, the farmers had been promised by Uganda Development Corporation that their fruits shall be bought at Shs 600 per kilogram. Joseph Opit, a farmer from Serere district said farmers in Teso region have always suffered in the hands of middlemen who end up exploiting them by giving them little pay for their produce. Ben Eumu, another farmer from Ngora district asked UDC to come clear on the prices for the fruits. He also advised that UDC should have a contingency fund to support the factory production by purchasing some acres of land for fruit growing in Teso. But Douglas Ndawula, the CEO of Soroti Fruits Limited said they cannot disclose the price in order to avoid unnecessary competition from other companies involved in juice processing. Ndawula is optimistic that Soroti fruit factory will provide a ready market for the fruits grown in the region all year round, enhance household incomes and improve livelihoods.